Quick assessment and expert care are key to successful stroke treatment. Curtis Wood benefitted from both through Mayo Clinic's Comprehensive Stroke Center. The last thing Curtis Wood remembers before waking up in the hospital was trying to close a bag of bagels. On Jan. 27, 2016, the Titusville, Florida, resident went to a local hardware store to pick up supplies for a home improvement project. While there, he began to feel disoriented. "I couldn't recognize my surroundings," Curtis says. "I was very confused." Despite his confusion, Curtis decided to stop at a bakery before heading home. But when he tried to fold the paper bag holding his bagels, he realized something was seriously wrong. Curtis called his wife Nancy. "He started saying, 'My fingers, my fingers, the bagels…,' and I told him, 'You may be having a stroke,'" Nancy recalls. Nancy's instincts were right. Curtis was taken to Parrish Medical Center where doctors found that he had, indeed, experienced a stroke. When Nancy arrived, she realized the severity of the situation. "I grabbed his hand, and said 'I'm here.' That's when I realized he was paralyzed on his whole left side," Nancy says. Nancy's fears were eased a bit when she learned that Parrish Medical Center was using telemedicine advances to help assess her husband's situation. The hospital was the first in the state to join Mayo Clinic's telestroke initiative, a unique program that connects patients with experts at Mayo Clinic's Comprehensive Stroke Center. 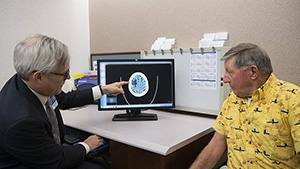 Using a telemedicine robot, Mayo Clinic neurologist Benjamin Eidelman, M.D., could see and speak to Curtis, even though the two were more than 200 miles apart. Through that evaluation, Dr. Eidelman determined Curtis had suffered an intracerebral hemorrhage. This kind of stroke occurs when a weakened blood vessel ruptures and bleeds into the brain. The blood accumulates and compresses the surrounding brain tissue. Treatment options for this type of stroke are limited. But at Mayo Clinic a clinical trial offered a potential treatment for Curtis. 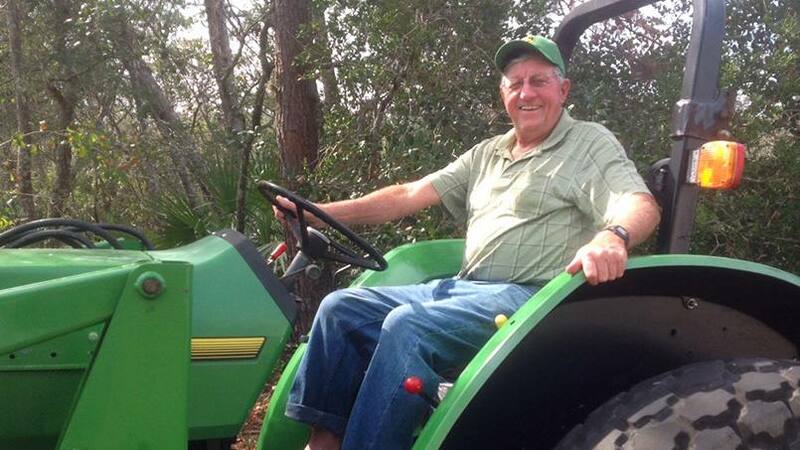 Arrangements were made to transfer him to Mayo Clinic's Florida campus. Though it accounts for just 13 percent of all strokes, hemorrhagic stroke is the primary cause of stroke-related death, says W. David Freeman, M.D., a neurologist and director of Mayo Clinic's NeuroCritical Care unit. Only about 25 percent of patients survive this type of stroke. Those who do survive often have significant complications. Institutions around the country are actively trying to find new ways to treat these patients, Dr. Freeman says. As part of that effort, Mayo Clinic participates in a stroke research clinical trial led by Johns Hopkins University. Known as MISTIE-III, the trial assesses the potential of a minimally invasive surgical treatment of intracerebral stroke. During the procedure, physicians place a catheter into the brain via an artery in the groin and deliver a clot-busting medication. The goal is for the medicine to dissolve the clot that formed after the bleeding from the stroke stopped. The blood then flows through the catheter out of the brain and into a collection bag. "Stroke is a complex condition and prompt access to care can be the difference between life and death." — W. David Freeman, M.D. "The upside of doing this is you're using a chemical to dissolve the clot in a minimally invasive way, as opposed to having the patient undergo a big operation in which you can damage other healthy brain tissues while trying to get the clot out," Dr. Freeman says. The only other surgical procedure for intracerebral hemorrhage is a craniotomy. That procedure involves creating an opening in the skull to allow the surgeon access to the blood clot, so it can be removed. Curtis was the first patient in the MISTIE-III trial at Mayo Clinic's Florida campus. On Jan. 29, neurosurgeon Robert Wharen, M.D., performed the minimally invasive procedure on Curtis. At the time, the blood in Curtis' brain was about 41 milliliters, or the equivalent of about 3 tablespoons. Two days later, a CT scan revealed the blood had significantly reduced to 12 milliliters. Within a few days, Curtis was discharged to a rehabilitation hospital, where he underwent several weeks of physical, speech and occupational therapy to help him regain function on his left side. Today, Curtis is doing all the things he did before the stroke, including carpentry work around his home and refurbishing a tractor. He and Nancy spend as much time as they can with their family, which now includes four grandchildren and a great-grandchild. "We have a lot of family get-togethers and attend the grandkids' football games and dance recitals," Curtis says. "Stroke is a complex condition and prompt access to care can be the difference between life and death," Dr. Freeman says. "Mr. Curtis' story is an awesome example of the team-based, collaborative effort Mayo Clinic is known for, since the protocol required collaboration between stroke telemedicine, neurosurgery, neurology and neurocritical care." The Woods couldn't agree more. They are thankful for the collaboration between Parrish Medical Center and Mayo Clinic. "I feel it was so important in his treatment and recovery. If it weren't for the telestroke consult with Dr. Eidelman, after which he recommended Curtis' immediate transfer to Mayo, Curtis might not be with us today," Nancy says. "And I don't think he'd be walking and getting up off the chair if it hadn't been for the trial." Curtis concurs. "I've told everybody, 'If anything ever happens to you, make your way to Mayo Clinic,'" he says. Read about Mayo Clinic's Comprehensive Stroke Center.